Back in the mid-1980s, Trout Lake Pathway was a war zone. At the time, Michigan was struggling with the explosion of rampant, unregulated off-road vehicle use. ORVers were using this remote recreational area in the northwest corner of Gladwin County and had tore up its sandy slopes, widened the trails into race tracks and were four-wheeling it through delicate cedar swamps and streams. Beginning in 1987, DNR conservation officers staged a campaign to clean-up the area and crack down on the illegal off-road use. Today the woods are quiet and the land is healing. Left behind are reminders of what it took to win this war — huge cement barriers placed where ORVers were entering Trout Lake, dirt beams blocking the entrance of old two-tracks, rows of wood posts to prevent anything with a motor from using the trails. The pathway lies in the heart of the Gladwin Field Trial Area, a historic 5,040-acre track within the Au Sable State Forest. The area dates back to 1916 when tax-reverted lands were used to establish “a public grouse field trial area” for hunters and their dogs. By the 1940s the tract was known nationally as the preeminent grouse field trial area and began hosting the Grand National Championships on a rotating basis with New York and Pennsylvania. Today it hosts the national championships every other year. Because of its legacy with hunting dogs, the Gladwin Field Trial Area has special regulations that include a ban on ORVs and dirt bikes as well as horseback riding and mountain biking. Dispersed camping is not allowed, campers have to stay in one of the three state forest campgrounds: House Lake, Trout Lake and Hoister Lake. For hikers and campers what has emerged is a quiet area that is the perfect destination for a quick, mid-summer getaway. Trout Lake is only a two-hour drive form Southeast Michigan and half that time for campers looking to escape the heat in Bay City, Saginaw and Midland. Trout Lake Campground alone has 34 rustic sites well spread out along three loops including a handful perched right above the shoreline with a great view of the water. Nearby is a good swimming beach featuring a killer rope swing. All three lakes provide entertaining angling for bluegills and panfish. And if you want to get away from the handful of others in the campgrounds? Just hit the trail. Trout Lake Pathway is a 2.8-mile loop around Trout and Hoister Lakes with a cutoff spur between the two lakes. 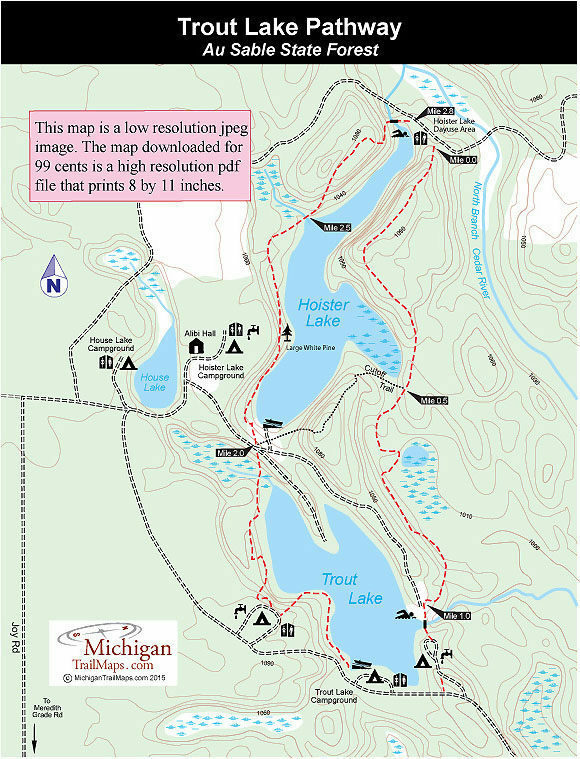 The easiest places to pick up the trail is at Hoister Lake Day-use Area at the north end of the 23-acre lake or the Trout Lake Boat Launch at the south end of that 28-acre lake. The day-use area is a great spot to begin and end the hike. If the day is hot, you can go from the end of the trail into the cooling waters of the lake in three steps or less. Along with a sandy beach and parking, there is a vault toilet at the area. From the parking area look to the east for a blue DNR pathway marker on a tree halfway up the ridge above the lake. The entire loop is marked by an occasional pathway marker or blue blazes painted on strategic trees. The trail immediately climbs to the top of the shoreline ridge and then follows it south, providing glimpses of Hoister Lake below. Eventually you descend the ridge and skirt a marshy arm of the lake (look for birdlife!) and then, at Mile 0.5, arrive at a marked junction. To the west (right) is the cutoff spur that descends a quarter mile to the boat launching site at the south end of Hoister Lake. Straight ahead and marked by blue blazes is the trail to Trout Lake. This segment is more difficult to follow with a bit of climbing though not overly challenging. At Mile 1, the pathway pops out at a cul-de-sac of sorts that overlooks the stream that drains Trout Lake. This is a favorite spot for campers from Trout Lake Campground to swim as one tree features an amazing rope swing. The pathway descends to the stream, using the dam to cross it, and then climbs into the third loop of the state forest campground. Follow the dirt road west past the second loop and pick up the trail at the Trout Lake Boat Launch. The pathway hugs the lakeshore before a steep climb to emerge at site No. 7 in the first loop of the campground. You return to the trail in the back of site No. 10. On the west side of Trout Lake the pathway stays on the bluff above the lake for views of the water below. At Mile 1.9 you descend to the first of a handful of streams to be crossed. There are no bridges so look carefully for the driest crossing and remember rotten birch logs often lead to soaked boots. At Mile 2, you pop out at a dirt road — on the other side is the second junction with the cutoff spur. To the east (right), the spur leads a short way to the Hoister Lake boat launch. Straight ahead (left-hand fork) is the pathway along the west shore of the lake. This final leg of the loop is the most interesting portion of the hike. The pathway weaves along the shoreline and around marsh areas where in June you can still see bluegills on their nests. Within a quarter mile the trail passes a white pine whose trunk is so massive and so out-of-proportion with the surrounding trees that it’s impossible to miss. At Mile 2.5 you enter a cedar swamp and tip-toe along a fallen tree to cross another stream before the pathway climbs to the top of a ridge for a view of Hoister Lake below. Within 200 yards an old log stairway descends the ridge and the trail emerges in the day-use area at Mile 2.8. 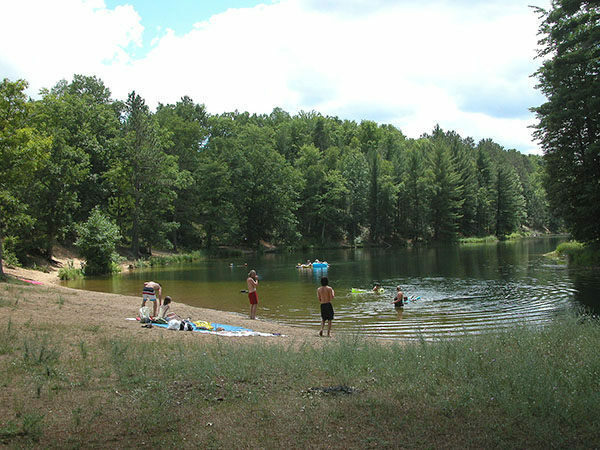 There are three state forest campgrounds around the lakes of the Gladwin Field Area. 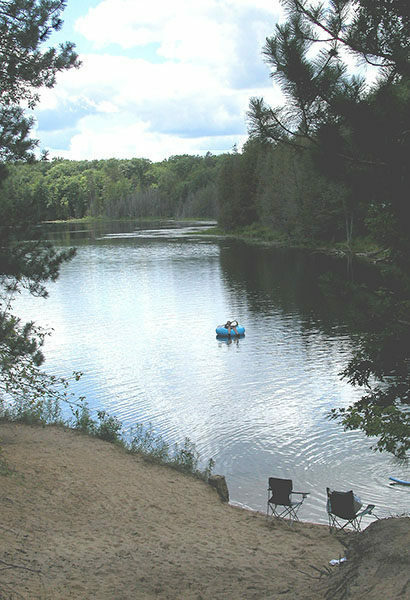 House Lake Campground has 10 sites with three sites in view of the small lake. Hoister Lake has 23 sites in a semi-open area that includes Alibi Hall, the historic meeting place for dog handlers in the Gladwin Field Area. The most pleasant campground by far is Trout Lake with three loops at the south end of the lake along with a boat launching area. This campground has 34 sites with almost a dozen of them perched above the lake with a view of the water. All campgrounds are rustic with hand pumps for water and vault toilets. There is a nightly fee for camping at the state forest campgrounds but none for day users who arrive just to enjoy the pathway. From the hamlet of Meredith on M-18 head east on Meredith Grade Road for 1.5 miles. Turn north on Joy Road, where there is a small state forest campground sign, for 0.8 mile and then east (right) where there is large “Gladwin Field” sign. Within 100 yards head north (left) at a DNR sign indicating “Hoister Lake” — follow the dirt road for a mile to the day-use area. Taking a left at the last junction leads to the three state forest campgrounds. Call the Gladwin DNR Field Office (989-426-9205).